Link: The UK Daily Pundit: Chattering Classes Hijacking Democracy. Exactly. And another thing the eco-fascists don't tell you is how many would die as a consequence of scaling back modern civilisation to meet their emissions targets. Don't worry. Those targets won't be met anyway. Britain produces less that 2% of the world's carbon emissions. Production won't be reduced; it will simply be transferred to India and China. Britain will be taxed to oblivion for nothing. "Climate change", like the "war on terror" is just a pretext for a larger state, with more government powers and more taxes. I regret that I have no religious faith. As a young man I was an evangelistic atheist, mocking people with religious views and encouraging them away from their gods. Not any more. Life is hard. Death is ever-present. A belief in a higher power and the prospect of divine justice is valuable. Until recently, I did not understand how much my life as an atheist in Britain depended on the Christian beliefs of others. Their belief in “turning the other cheek” led them to meet my youthful scorn calmly, tolerantly and even lovingly. Various attempts to win me back to the faith of my fathers failed, but at least I learned from those attempts that I should respect their beliefs. I stopped evangelising against them and came rather to envy their faith. Every death in my circle has hurt me more than it has hurt the believers around me. As my parents advance into their seventies and I face the prospect of losing them, I sincerely wish the rational voice in my brain would just shut up. Our society was shaped by Christian thought. It was not rationalism that caused us to abolish slavery, well before France or America, it was William Wilberforce’s Christian belief. Public health, education, social welfare and other reforms were driven not by socialist ideas but by the desire of Christians in public life to serve God by serving their fellow men. "Hath not a Jew eyes? hath not a Jew hands, organs, dimensions, senses, affections, passions? fed with the same food, hurt with the same weapons, subject to the same diseases, healed by the same means, warmed and cooled by the same winter and summer, as a Christian is? If you prick us, do we not bleed? if you tickle us, do we not laugh? if you poison us, do we not die? and if you wrong us, shall we not revenge? If we are like you in the rest, we will resemble you in that." In an Elizabethan context, this was phenomenally tolerant. 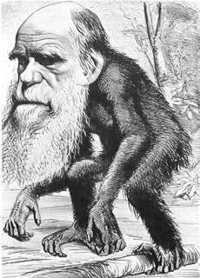 British Christianity was always fairly “soft.” Consider how the Church reacted to the writings of Darwin. They were seen as a huge threat to Christianity and, had the Church been of the same spirit as some modern faiths, he could have been expected to be killed for his heresy. He delayed publication to spare his wife the social discomfort of being married to an heretic. But he never feared for his, or her, life. When he realised that his ideas were about to be published by another, he went ahead without fear of anything more than derision. I don’t think he was subjected to anything like the hostility that someone like Ray Honeyford experienced, for example. I am not alone in losing my faith. Christianity, certainly of the Anglican variety, has declined steeply during my lifetime. The polite fiction of belief on the part of Prime Ministers has become almost unsustainable. A church-going PM is as out of step with the British people as he could possibly be. Tony Blair has brilliantly side-stepped the issue by exploiting his wife’s religious faith and appearing to be a polite passenger in her heavenly chariot. I have come to accept that my values and beliefs (apart from the critical belief in God) are very much those of my Christian forefathers. I do believe in doing unto others as I would have them do unto me. I am no good at turning the other cheek, but I do try to understand hostile opinions and not to be dismissive of those who hold them. There several things I do that I do not care to write about that don’t make sense if I were acting merely from self-interest. Nature abhors a vacuum. I think our nation is missing its faith. The underclass is godless in every sense. Legal restraint is no substitute for moral restraint. Policing by brute force will never be as effective as policing with the consent of a community that shares some key values. Many a young hoodlum will swagger in the face of the law whose grandfather was no better a man, but behaved better to retain the respect of his community. Now that his community knows no law but that of the jungle, he had best be the most vicious animal around. We know what the word “respect” means in such communities. It has the same meaning as in the Mafia phrase “a man of respect.” It means fear, which is not at all the same thing, unless you think that for Jane Austen, a respectable man was a man to be feared. This vacuum of faith will be filled with something. New Age mumbo-jumbo is noticeably religious in tone. It provides substitutes for the soothing ceremonies of religion, echoing the rituals and even the annointings. Peoples’ hobbles are more intense and obsessive than ever, as they search for meaning in their lives. The ferocity of the beliefs of Greens and animal rights activists often seem to me like misdirected religious fervour. Greenery is really the worship of the goddess Gaia; an effective deifying of the Earth itself. People need to believe something. What it is and how right it is seems to be almost irrelevant. Observe the factionalism of the British Left and you will find many echoes of religious schism. All of this has been a worry for some time. A worry, but not a clear and present danger. Now however Britain’s vacuum of faith has sucked in a new terror. Ask yourself this question. Would the primitive, bloody, backward and reactionary religion of Islam prosper as it does in our towns and cities if there was a more plausible alternative? When a young man from a working-class Muslim family sees the brutal drunken behaviour of the white chavs who may be his only contact with the native community, is it surprising he draws closer to the faith of his fathers? When a young Muslim woman sees the brutal sexual marketplace of the British underclass; when she sees them sexualise even their pre-pubescent daughters by dressing them like their pathetic “celebrity” god-substitutes, is it surprising that she retreats into safe certainties? I understand the attraction of religious faith. I understand the human need for a light in life’s darkness, for some certainties in its chaos. In this respect, as in so many others, our immigrants have the capacity to do us good. They are reacting to what they find. If we provide government information in their languages and translators for their children in our schools, then they don’t see any urgent need to learn English. Is that their fault or ours? I say it’s ours. If they see no moral imperatives in our society but tolerance, and if our tolerance leads us, in so many ways, to accept what they find unacceptable, they will inevitably cling to the moral certainties of their faith. Is that their fault, or ours? I say its ours. I doubt if we can now recover our religious faith, but we have to rediscover - somehow - a moral code. If we open our minds to what is going on around us, we can see that - for all our justified fears about Islamic extremism - many of our current problems are not a question of what is wrong with them, but what is wrong with us. Travelling on business this week, I have spent a couple of days in Bucharest. Most of today will be spent, tediously, making my way back to Moscow. It was interesting to talk to Romanian colleagues yesterday about attitudes to the EU. Generally, Romanians are in favour of joining, but apparently there is some reserve. People are concerned about what it means for their society and culture. They are concerned about being a small, relatively poor member of a club run by (and they assume for) the large nations. They are also a little hurt about the British decision to derogate from the "free movement of labour" provisions of the Treaty of Rome in relation to Romania and Bulgaria when they are first admitted. "You have admitted hundreds of thousands of Poles," one commented, "but Romanians are not acceptable?" I found it hard to put a case for what the Government is doing. It continues to admit, with no apparent restriction, non-EU immigrants from Muslim countries. These are people who are consistently shown by opinion polls to have aspirations inimical to our culture. Any Romanians who come to Britain as EU citizens will not be looking to import Romanian Law or impose Romanian culture. We continue to welcome people who despise our culture and our way of life and want to impose their own. They make no effort to fit in, and we make no effort to assimilate them. Yet it never seems to occur to us that the citizens of the recently acceded and soon-to-accede EU states could solve all our labour shortages without posing any threat to our way of life. Most would anyway want to return to their own homes and families - and to their own language and culture - in time. Already lots of citizens of northern Europe are looking to the New Europe for retirement homes. It sometimes seems the main impact of the EU will be to divide peoples' lives between production in the North and retirement in the South. Is it fair to expect freely to buy a retirement villa in Bulgaria or run a business in Romania, while preventing Romanians and Bulgarians from getting jobs in Britain? I have seen big changes in Bucharest since I was last here. Everywhere there are signs of gradually-growing prosperity. 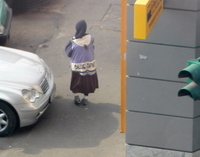 Yet the image the British seem to have of Romanians remains that of the old lady I snapped on the street this morning. That's sad. Link: Scotsman.com News - Politics - Claim Scots suffer as more Poles need services. What drivel! Why demonise the Polish workers for getting in the queue for Scottish benefits? I lived in Poland for over a decade. No government or local government information was available in anything but Polish. It never occured to me to expect otherwise. I didn't think the Poles were "racists" or that they failed to be "inclusive." If I showed up at a local government office unable to make myself understood, or without a friend who could help me do so, I would - I suspect - have received short shrift. I don't think Poles coming to work in Britain expect anything different. They will have learned some English and will understand the need to learn more. Why, when the tax burden in Britain is now higher than in Germany (all without Germany's incredibly generous social provision, its efficient police force, its clean streets, its adequate road system or its beautifully clean public transport by the way) would we be spending taxpayers' money on translators? When is it ok to speed? Link: Adelaide Green Porridge Cafe: When is it ok to speed?. Wonderfully creative subversion in Australia. It gives one confidence that the people will always find ways to frustrate the police state. Link: Guardian Unlimited | The Guardian | Cameron's approval ratings slide. This is sad, but not surprising. The British people just don't need another Tony Blair. This research was conducted in November 2004 and is very telling. Have a look at Table 2 which presents the percentage of respondents in national samples by Muslim country who labelled certain acts and events “terrorist”. Only 28% of Lebanese Muslims and 9% of Palestinian Muslims consider attacks on Allied forces in Iraq to be terrorism, for example. Maybe that's understandable, given the information available to them and the way the Allies' role there, trapped as they are between various armed factions funded by Iran and Syria, is presented in the media. Even medical journals now blame the Allies for the people killed by those terrorists "insurgents". But how about this statistic? Only 22% of Palestinians believe the 9/11 attack on the World Trade Center was terrorism. Read it and weep. These people are beyond the pale not just of Western civilisation, but of civilisation itself. Why do US and EU taxpayers subsidise these murderous folk to the tune of $1 billion? Let's just stop the aid now. It's certainly not buying us any love, peace or gratitude. Link: Proceeds of Crime Act 2002. Britain implemented the EU’s Second Money Laundering Directive, partly by the Proceeds of Crime Act 2002, which was enacted on 24 February 2003 and partly by the Money Laundering Regulations 2003, made by the Financial Secretary to the Treasury, which came into force on 1 March 2004. You probably didn't realise that these laws require your bank, your lawyer and your accountant to denounce you secretly to the authorities if they suspect you are investing “proceeds of crime”. You probably think of money laundering in the context of organised crime. However, the rules apply to all crime, however trivial. For example, if you failed to declare some of your income last year, the pounds you should have paid in tax are now “proceeds of crime.” Once upon a time, a lawyer or accountant who noticed your error, would have pointed it out and advised you to fix it. Now, if -say- you are buying a house partly with that money, he must also inform the authorities. It is a crime for him not to do so. Actually it can be a crime for him not to notice, as he can be convicted if he should reasonably have suspected that proceeds of crime were involved. Telling you about his suspicion is “tipping off” - also a crime. Instead of advising you how to comply with the law, he is now obliged, on pain of imprisonment for up to five years, a fine (or both), to drop you right in it. He is effectively a secret policeman, working against you at your own expense. If you look at the “retainer letter”, “standard terms of engagement” or “account agreement” you signed when you became a client of your bank, accountancy or law firm, you will find some weasel words to the effect that they will respect your confidentiality “to the extent permitted by law”. Historically, there was always a risk that they would be ordered to disclose information by a court. You probably thought that’s what those words meant. You may have a mental image of your trusted professional defending your confidential information until all legal appeals are exhausted and he reluctantly complies with a court order. That’s how it was, but not any more. Now the fees you pay have been increased to cover the costs of employing individuals specifically to comply with the legislation. Those individuals have the telephone number of the SOCA (the "British FBI") and are constantly calling them to report suspicions. This is not theoretical. I assure you that every bank, law firm and accountancy firm in Britain is now regularly briefing, training and haranguing its staff to comply. Section 337 of the Proceeds of Crime Act specifically absolves professionals of their confidentiality obligation. Any disclosure the Act obliges them to make “is not to be taken to breach any restriction on the disclosure of information (however imposed)" Whatever they may have agreed with you; whatever professional ethics they follow, they are not doing anything wrong, because their political masters say so. Successive versions of these laws were promoted (and passed by the somnolent poodles in Parliament) as counter-drugs and later counter-terrorism measures. Today these are the all-purpose excuses for all bad laws. Utter the words "terrorism" or "drugs" and the critical faculties of electorate and legislature are switched off. The act which generates the “proceeds of crime” need not even have been criminal in the country where it happened. The most famously stupid example is that a solicitor acting for a Spanish bullfighter buying a house in London should report him secretly to the police because bullfighting is criminal in Britain, so his earnings are “proceeds of crime”. The government is considering an amendment to correct that particular stupidity. Knowing these people as we do, they will probably slip in something worse in the process. All this is a rusty, poisoned dagger to the heart of the lawyer/client relationship. It is also a death blow to the independence of the legal profession and a further step on the road to a police state. Companies and individuals spend millions on legal advice every year. They live in complicated societies with complicated rules, with which they want to comply. They go to their lawyers, not to be “shopped”, but for advice about how to comply or, if they have breached the law, how to bring themselves back into compliance. Maybe some of them have committed crimes. In modern regulated societies, it’s hard not to do so. But none have never consulted me about how to do it. Clients come to me because they have a commercial objective and they want to achieve it lawfully. If I point out criminality or potential criminality, they are always anxious to revise their plans to avoid it. How can I advise them, if they are afraid (as they now should be) to tell me all the facts? How can I help them stay on the straight and narrow path, if they are afraid to tell me which route they have in mind? Since my duty to sneak applies not just to my client but to his business partners, how is he supposed to do business with strangers knowing I will call the police if I don’t like the look of them? An independent legal profession may not be the most popular element of a free society, but it is a necessary one. If the profession is more answerable to, and more afraid of, the Government than its clients, then it is not independent. The British legal profession is already, by that test, a cur at heel. As are British accountants or bankers. Britain is currently planning to enact the Third Money Laundering Directive 2005/60/EC of 26 October 2005. into local law. The government's implementation will no doubt be just as enthusiastic, vigorous and early (some Member States still haven't implemented the last one) this time as last. There's something for formerly respectable professionals to look forward to.